It takes guts to make your mark in a challenging location - now the onus is on others to follow suit. unfortunately not too many options up here. They use Pioneer Coffee and besides doing an awesome job with it, they have got to have the best collection of home cooked style light lunches. Ok, so they use Vittoria, but if you are going to drink that stuff it should be here. Gy, the barista is no less than awesome. Of course both the Pioneer Locations. Anyone got anything for Cairns?? If your heading further north then Cairns and to Port Douglas try Re-hab opposite the coles shopping complex on the main strip. Went in yesterday on a recommendation and was floored that they had a Mazzer Major for decaf!!! and a Mazzer Robur for the house blend, comparatively only let down was a 2 group San Marco machine although it was a dual boiler and I was told they were looking to upgrade to a 4 group soon. They don't do much food though as they didn't have a kitchen installed and the main focus was on coffee (nothing wrong with this at all). Ordered a flat white and got silk milk and latte art with the supreme coffee roast continuing to live up to be a balanced but well rounded coffee. They saw me oogling their setup and got a tour by the owners and a had a good chat to Glen the Head Barista, good friendly team there. Heading to Cairns tommorow but in my experience its mostly a Lavazza dominated town. Will post up if i find anything worthy of mention. nice to heart hat they've got some good clobber up north - let us know if you find any other gems in your travels! Hoona Dog in Nambour get consistently good reviews , using montville coffee. Hi, we are staying on the Sunshine Coast in a few weeks time and will checkout as many cafes as we can including those mentioned in this thread. Of course a visit to the Pioneer Roastery to catch up with T.A. will be mandatory, so are there any other coffee hot-spots (including the hinterland) worthy of a visit? Ok mate - sounds good; looking forward to the fruits of your travels! I was in Maryborough just last week, I wish I'd checked this thread sooner! First it was the coffee crawl, then the coffee road trip and now it's the coffee base camp. So what are we doing here at Caloundra in a penthouse suite with magnificent views over the Pumistone Passage with four days to explore the coffee hotspots of the Sunshine Coast? Simple, the price. Opening specials plus pre-Christmas discount means we are getting this suite for way less than half price! But for us there is another price to pay.....this new place is high-tech (all touch-pad ) so that it will take us all week to settle in (the 4th age of computers....the ubiquitous age is already upon us! ) and my only real disappointment is the advertised in-kitchen DeLonghi espresso machine......its a Nespresso and I've brought an 0480 and my favourite plunger/frother which were going to get a decent workout with beans from the Pioeer Roastery. First morning and we are pounding the new $8.5 million boardwalk (well O.K. walking it ) out to Kings Beach where, if I remember correctly, a good coffee is to be had at Elements, but things change so it's back into CBD Caloundra where we find the Otranto Cafe (Wega/Mazzer/Merlo) and it's already packed at 6am. Sitting back enjoying my coffee it dawns on me that something is odd!......the coffee is less than $2 and the crowd are all pre-babyboomers.....not the usual crowd you'd expect with that WMM combo! Then I notice the half-price coffee to 10am sign and a 40 seat bus parked around the corner with Hibiscus Retirement Resort signage. You know, they are a lively crowd and I spotted them again at a local Italian restaurant that same evening...still going strong! Maybe the next phase of our lives will be at the Hibiscus! Later that morning as we head off to Pioneer Roastery, I notice that 'the Kaff' (Belaroma) also has a good crowd. At Sunshine Beach we pick-up Professor of Surgery, Prof D.C.(Bezzera/Mini-Mazzer), who is just finishing a service on his espresso machine. The deft hands of a surgeon who has trained a generation of young surgeons in the art of key-hole surgery is using an orthopedic drill on what looks to be a circular brass plate above the showerscreen on the grouphead. He probably has the only 'surgically enhanced' machine in Australia! Out at the Pioneer Roastery, we catch up with T.A. and what an obliging guy he is! Tim postpones a roast to jump on the Reneka and is soon (in that distinctive style of his) turning out Mocha-Javas and Columbian single origins for us. Prof D.C. is impressed. At Belmondo's fine foods on the way back, at the mere mention of coffee, the cashier gives us T.A's ratings of the coffee outlets on Gympie Terrace (Noosa).....around here Tim is all pervasive (as he should be). Back at Prof D.C's, he runs some Mocha-Java through his machinery and as we enjoy the result he outlines his dream to open a retro-retro 1920's style left bank of the Seine (a la Cafe De Flore) establishment to promote discussion and debate in the Arts and Sciences, but I can't tell if he is just having a lend of me! After a 6am visit to Otranto's, we motor to 'Moobar' to begin tasting at the northern end of the Esplanade. I know this strip quite well and the first coffee is at Cracked Pepper (Klub/Pioneer Java-Mocha)....chalk and cheese when compared with the Pioneer Roastery,then on to Karma Waters (Rancilio/Grinders), Deco (Wega/DiBella) and then Beach Bakery (Klub/Map) where, interestingly, Map is an Office-Works blend.Sugar and Spice has 2 by 2 group ECM's and roast their own while next door is Olivers (Wega/Primo). A little further down is the iconic Casablanca (WMM combo again!) which does a great $5 coffee/cake special....only the last time I ordered the special the cashier asked me, when I went to pay, whether I enjoyed the cake. I replied that I'm sure I would have if only it had been served! (but I'm still happy to give them my patronage). Around the corner, the cafe in the original Aromas site has gone and I'm not a little surprised. On my last visit there, when I went to complain about the coffee to the owner/barista, a guy was already in front of me and he was being complimentary. As a truckie,apparently he has tasted coffee at truckstops all-around Australia and this coffee is as good as any. It seems that there is no accounting for tastes! In First Avenue, which runs parallel to the Esplanade and one street further from the beach, inside 'Europe on First', I spot the barista staring wistfully into the street but it's a ghost-town....little foot traffic here and what a pity! That red Sibilla always gets my attention and apparently T.A's as well. The day before, he was here and was allowed behind the machine but no invitation is forthcoming to me. So, in summary, there are plenty of places in Mooloolaba where you can get a 'good' coffee, but none for 'great' coffee. Perhaps if 'Europe on First' changed coffee and had a happy hour like Otranto's, they might get the customers. Which reminds me, to increase sales of cappucinno's in slow periods,G.J's have introduced a happy hour with an outside sign proclaiming 'CAPPY HOUR'. They best be careful of someone with a marker pen....one letter would do it! Next stop is Rocco's Italia at Mudjimba and somehow we've approached it through Bli-Bli, passing innumerable signs indicating that Mudjimba ia up ahead but we must have blinked because next minute we are funnelled back onto the Sunshine Motorway and heading south, which poses the question: does Mudjimba really exist or is this a prank which Sunshine Coasters play on hapless tourists? It's 5.51am and I leave our apartment for the 9 minute walk up through the CBD to Otranto's. At each intersection, I am joined by others and soon, here we are, a half-dozen strangers, no-one talking, 'coffee soldiers' marching to a ritualistic beat. This is weird but I am relieved when two of our number peel off into a newsagents with the remainder dispersing into cafe Otranto and later, as I sip my coffee, the other two appear,newspaper under arm and for a minute I thought they'd gone AWOL! At Eumundi, in the town centre, there is a choice of The Fig Tree (Pioneer), Food @ Eumundi (Signature Roasters),Chuckles (Toby's Estate),Green Bean Cafe (Vincenza) and Red Dog Cafe (Toby's Estate) and I choose the later since they also retail coffee machinery and it turns out to be a good choice. Barista Angel is a gem and she works that Vibienne a treat! Down in the markets, the choice is between Matthews(Wega/Cosmopolitan) or Bean and Gone (Rancillio/Own roast) where owner/barista Grant is cagey about his blend but for my money, Red Dog is the standout here. On Hastings Street at Noosa, I tried coffee at Sierra Cafe Bar (that WMM combo again!) and Berardo's (Gravity), but in another class are Aromas (twin LaMarzoccos/Noosa Gold) and Hard Coffee(LaMarzocco/ Campos) with the later the better (T.A's favourite). And aren't the two baristas there the most baristary looking baristas you've ever seen? Need a barista for a photo shoot/ T.V. advertisement/movie bit part? Then go no further! Another 'Arthur and Martha' moment sees us miss the Maleny turn-off at Landsborough and we finally end up at a place called Beerwah.....the locals look like they enjoy a 'coldie' but are not really into coffee just yet. Maleny is more a 'coffee town' than Montville with cafes like Maple3 (Bezzera...not surgically enhanced/Andronicus), Big Byte(Gaggia/Lavazza) but after a half-hours legwork, I narrowed it down to Flavours(another Sibilla/Amore), Monicas(WMM) both with good coffee but Colin James(LaMarzocco/Veneziano) was a great coffee from a well- trained barista. Also of note is the inhouse roastery at the local IGA....you might remember the town's struggle with accepting a Woolworths in their little town a few years back. Further up the range is Montville with a plethora of cafes serving average coffee so we chose The Edge(LaVenezia/Vincenza), mainly for the view....apparently, according to a local trader, many Montvillian discerning coffee drinkers travel to Maleny. So there it is, an ideal coffee circuit on the Sunshine Coast for tourists or Brisbanites would be Colin James, followed by the Pioneer Roastery then Red Dog and finally Hard Coffee with a preference for Wednesday since Eumundi Markets are open and T.A. is rostered at Pioneer. Now, as we motor south towards Brisbane, the coffee base camp at an end, I notice a sign which says 'You are leaving the Sunshine Coast'.....maybe it should read 'You are leaving T.A. territory'! Hi CjM - thanks for this - great to have the rundown! Try also Caffeine Culture in Duporth Ave in Maroochydore. Not a big place but quite qurky, a bit of a Melbourne feel.. The guys down there are the distributors for Veneziano and only do coffee. They change the blend regularly and usually have a single origin on the go as well.. I'm just going to add Costa Noosa to the mix of great Sunshine Coast coffee locations. I put them up there with Pioneer, and did both of them in one day once, and it's a tough call between the two. They roast their own there. I've had a few visits to Pioneer Roastary the last week. The place has been spruced up a bit. The coffee is still fantastic and the place is as busy as ever, and Kate's got her own "katies blend" on sale. They are also now on facebook too. This is still my favorite place to have a coffee. I've never had a bad coffee at Pioneer. I was told by a few people that I should go check out Clandestino Roasters at Belmondos Fresh Food market and today I got the chance to pop in. I wasn't all that excited because i've been told about places before and they where a let down. Wow is all I can say! I was blown away. They are down the back of the food market with a massive big plane strapped to the room. Nice touch. 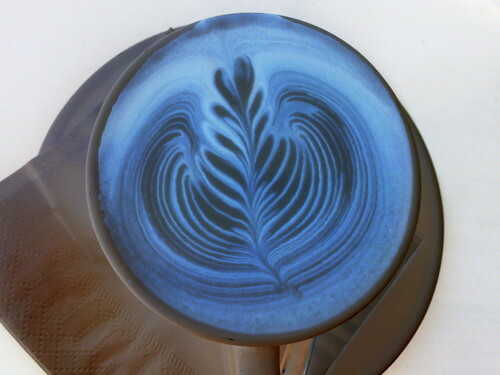 Clandestino Roasters, 59 Rene Street, Noosaville, Queensland 4566. They roast there own coffee on site and from what I saw there was about 6 coffees on offer, blends & SO and I was told that they would be changing their blend regulary. It's the first time I've seen other brewing methods on sale on the Sunshine Coast, they had Chemex, Pour over, Syphon, Cold Drip. I've never had a syphon done for me so I opted for that and they offered Guatemala Acate Antiqua at a lighter roast. I hung around to watch the guy making it and I ended up getting a full run though on how to brew syphon coffee which was very useful. The staff where all very friendly and the atmosphere was relaxing. I didn't have an espresso but I will definately be returning to try some other coffees including the other brewing methods they are providing. The coffees they where serving other customers looked great with lovely latte art that I would expect to see at places like Pioneer Roastery. It's such a breath of fresh air to have speciality coffee starting to take an interest here on the Sunshine Coast. Although I love Pioneer Roastary, it's a good 25 drive for a coffee there and only espresso on offer. Clandestino Roasters are on my run up to Noosa which I do 3-4 times a week which will be nice. Wasn't totally keen on their beens just sitting in huge bowls on the counter ready for a passing customer to cough all over they and touch a feel though. Not sure if they where for sale or just for display. Seemed a little strange because most places follow the accepted method of having beans roasted and bagged straight away to preserve the freshness. Anyway if your in the area check them out, they are in the industrial estate just behind Noosa Civic, or enter from the other end and drive down from the new Bunnings site. They've only been open a short while, 14 weeks I think I was told, but I'm sure word will spread fast! If I'm not mistaken, they have a W6 Geisen - although I've not seen it to be absolutely sure. I had quite a few long discussions with Ryan about 8+ months ago when he was looking at purchasing a Geisen. Went back got a Latte yesterday. Very nice And it's a nice touch when you get a little description of the coffee on paper with your coffee. definately a much visit if you hit the coast. Hours are 9-4 m-f and 9-3 sat. If anyone's up this way let me know it would be nice to meet you for a coffee and have a chat. Has his own Coffee Cart and other stuff... Worth catching up with him if your in the area.. NOTE: Tim is part of the QLD team that is in training for the Cafe Biz show late May. I was told by a few people that I should go check out Clandestino Roasters at Belmondos Fresh Food market and today I got the chance to pop in.